The new Stradale was unveiled in Geneva and delivers a killing blow to wannabe race coupes with seating for four at a top speed of 188 mph and shifting that happens five times faster than you can blink. Maserati debuted and is showcasing the new four-seat GranTurismo MC Stradale on the stand alongside its new Quattroporte - which debuted in Detroit last month. The Stradale takes the spotlight as the ultimate small luxury sports coupe. Already well on the way towards excellence with the two-door Stradale and the Made in Modina label, the GranTurismo MC Stradale takes inspiration from the racing version that competes in the Maserati Trofeo Championship, combining sportiness with luxury and elegance in the way that only Italians have mastered. The MC Stradale features beautiful racing aesthetics molded in such a way as to evoke luxury to go with that speed. The clear racing edge and carbon fiber bonnet frames the Maserati grille intake, behind which the 48:52 front-to-rear weight distribution centralizes the driver's position on the frame. Incidentally, that carbon fiber hood means the four-seat has the same dry weight as the outgoing two-seat model and adds 25% higher downforce at speeds over 86 mph, improving stability. Inside, the four seats are surrounded with new materials throughout the cabin. In signature Maserati fashion, leather, carbon fiber, and top-relief stitching come together to bring yacht-like luxurious comfort into the car. Underneath that fiber hood is the new and most potent 4.7-liter V8 Maserati has to offer, giving the car a 0-62 mph time of a mere 4.5 seconds and a top speed of 188 mph. This Low Friction Program 460CV engine couples with a race-tested MC Race Shift transaxle gearbox, which upshifts at a speed of 60 milliseconds - five times faster than the blink of a human eye. Three driving modes - Automatic, Sport and Race - successively increase throttle response, skid-control and exhaust note. All of this dynamic power is controlled by carbon-ceramic brakes from Brembo under all four wheels. An enlarged master cylinder and Pirelli PZero Corsa tires facilitate better response as well. 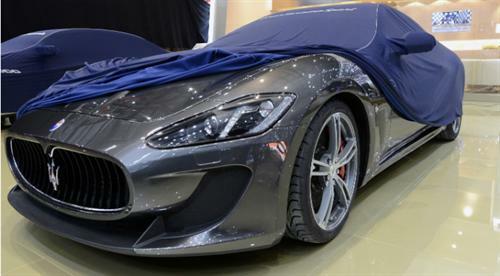 A truly beautiful car, the Maserati GranTurismo MC Stradale begins delivery this month.